IELTS writing task 1. The topic is about speed cameras. The graphs below show the number of drivers in Britain who have been caught driving too fast by speed cameras placed on roads, and the number of people killed in road accidents, over an eight-year period since the introduction of speed cameras. The tables shows the results of a survey on people's opinions on speed cameras. 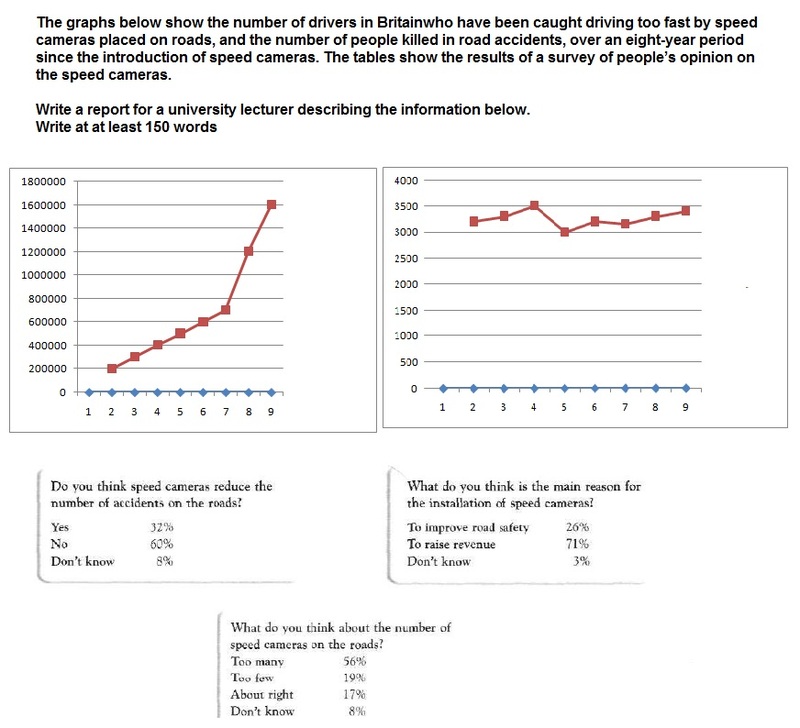 While the graphs illustrate the number of Britain drivers who have been detected driving too fast by cameras installed on roads, as well as the number of casualties over an eight-year-period; the tables give information on how people think about speed cameras via a poll result. In general, even though more and more drivers are fined, the number of deaths caused by traffic accident changes slightly with the negative opinion of citizens against speed cameras. It can be seen obviously that the number of drivers violating speed limit rises dramatically, starting at 200.000 and then rocket to 1.600.000 in the period. In other words, the data for careless drivers in the 8th year is eight times higher than in the 1st year. In contrast, the number of fatalities caused by road accidents fluctuates with small dips in the 4th and 6th years . Clear perspectives of people about speed cameras can be drawn from the tables. Nearly two-third of participants think that speed cameras are ineffective in reducing traffic collisions. In addition, 74% of interviewees believe that the purpose of setting up cameras is not for road safety and more than half subscribe to the idea that those cameras are redundant. Ngo, you have written too many words for this essay. You will lose editing time when you write more than 175 words for this sort of essay. You must allow time to review and edit your writing because turning in unedited work could result in a lower final score for you. Also, the paragraph requirement for the Task 1 essay is 4 paragraphs. You only presented 3 paragraphs. This could prove to be an issue for you in the actual test setting. The opening paragraph should properly identify the types of images given for the essay. By saying "While the graphs..." it appears that you have already identified the type of images presented, which should be the first sentence in the first paragraph. You did not do this. Therefore your work appears to start at the middle of the essay, with you fully expecting that the reader knows what images were presented to you. The idea is that the reader has not seen the images so your report analysis should first identify the images. Then you can say "While the graphs..." but not before then. Your trending sentence should have represented the 3 identifiable measurements in the essay. One for the number of accidents, the other for the opinion of people regarding the speed cameras, and finally, the reason why people think speed cameras are needed. Your trending statement is therefore incomplete. In this instance, due to the number of graphs provided, the trending statement should have been the second paragraph after the opening summary, thus completing the 4 paragraph requirement for this task. When you mention the small dips, mention the figures in the chart. Remember, this is a factual report. Data must be accurate and complete. Your report leaves the reader guessing most of the time, hence it does not come across as truly informative nor useful in content. Never use fraction references when actual percentages are provided. Accuracy is the name of the game in this essay and by changing the information presentation, you create inaccurate reports and references. Using fractions then suddenly changing to percentages will cause undue stress for the reader and affect your TI and GRA scores as a confusion within the presentation is created, leaving the reader questioning what information has just been presented to them. Your job in this essay is to make the analysis of information easier, not more confusing, for the reader. Always use the data provided in its original form to complete the Task Instructions. Home / Writing Feedback / IELTS writing task 1. The topic is about speed cameras.